A gigantic early Irishman was recorded in the pages of the Strand Magazine in December 1895. The giant was of roughly the same dimensions as the creature disinterred by St Patrick, but his posthumous effect upon the world was of a decidedly more spectacular nature. The article is well worth quoting at length. Pre-eminent among the most extraordinary articles ever held by a railway company is the fossilised Irish giant, which is at this moment lying at the London and N.W. Railway Company's Broad Street goods depot, and a photograph of which is reproduced here. This monstrous figure is reputed to have been dug up by a Mr Dyer whilst prospecting for iron ore in Co. Antrim. The principal measurements are:- entire length, 12ft. 2 inches; girth of chest 6ft. 6 and a half inches; and length of arms, 4ft. 6 inches. There are 6 toes on the right foot. The gross weight is 2 tons 15 cwt; so that it took half a dozen men and a powerful crane to place this article of lost property in position for the Strand Magazine artist. Dyer, after showing the giant in Dublin, came to England with his queer find and exhibited it in Liverpool and Manchester at sixpence a head, attracting scientific men as well as gaping sightseers. Business increased and the showman induced a man named Kershaw to purchase a share in the concern. In 1876, Dyer sent this giant from Manchester to London by rail; the sum of £4.2.6d. being charged for carriage by the company, but never paid. Evidently Kershaw knew nothing of the removal of the 'show,' for when he discovered it he followed in hot haste, and, through a firm of London solicitors, moved the Court of Chancery to issue an order restraining the company from parting with the giant until the action between Dyer and himself to determine the ownership was disposed of. The action was never brought to an issue. The photograph of this fossilised (and therefore incredibly ancient) titan is extraordinary, for it shows a well-proportioned human being with arms folded across his chest and the head lying sideways as if asleep. 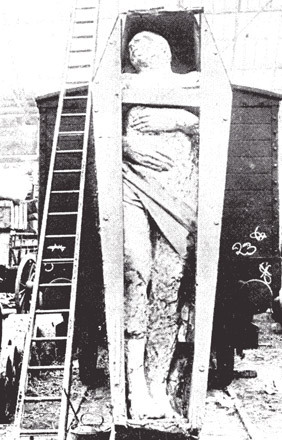 The body resides in a huge crate that is leaning against (and towering above) a normal goods truck in a railway siding. The lineaments of this antediluvian giant are beautifully symmetrical, and its tremendous height gives it an aura of weird power. As will be shown, these finds do not exist in isolation; they are the physical corroboration emphasising the underlying strata of all giant mythology. The memories of giants are strong in Ireland, where a whole prehistoric race, the Fomoiri, are remembered as being among the island's first gigantic inhabitants. They came as seafarers out of the depths of the western Atlantic and were supposed to have entered Ireland just after the ubiquitous Flood that finally wrecked the antediluvian world. The word 'Fomor' has been translated as meaning 'giant' and the Fomorians are also sometimes designated as gods, masters of the fertilising powers of Nature, wielders of thunder and lightning, sowers of mists and rain. They are in fact thinly disguised guardians of the earth's natural energy systems often interpreted in a metaphysical form. As we have seen, this is a far from uncommon occurrence m mythological history. In the English archives there is an important parallel to St Patrick's Irish giant and it is found buried in the pages of an old book, History and Antiquities of Allerdale. This work is a compendium of folk-tales, legends and factual historical data relating to Cumberland and certain localities centring around the Lake District. The entry pertaining to the giant differs from the usual treatment of this theme, for it is not a story but is rather a sober description of the uncovering of a giant's body sometime in the Middle Ages. The entry is headed, 'A true Report of Hugh Hodson of Thorneway,' and reads as follows: The said gyant was buried four yards deep in the ground, which is now a corn field, his grave being marked by an old, upright stone. He was four yards and a half long, and was in complete armour: his sword and battle-axe lying by him. His sword was two spans broad, and more than two yards long. The head of his battle-axe a yard long, and the shaft of it all of iron, as thick as a man's thigh, and more than two yards long. His teeth were six inches long, and two inches broad; his forehead was more than two spans and a half broad. His chin bone could contain three pecks of oatmeal's. His armour sword and battle-axe are at Mr. Sand's of Redington, and Mr. Wyber's at St Bees in Cumbria. Jesus' attempt to restore the tradition of monarchy and good government, though the Grail Code. Copyright © 2000 - 2019. All content on the www.goldenageproject.org.uk remains the property of The Patrick Foundation and may not be reproduced without the permission of The Patrick Foundation.